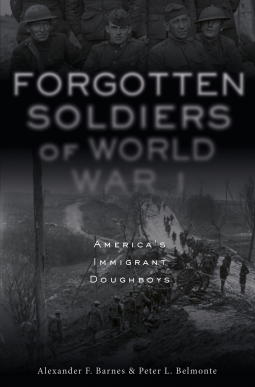 Forgotten Soldiers of World War I: America’s Immigrant Doughboys by Alexander F Barnes is an overview of immigrant soldiers who were drafted or volunteered for service in WWI. Barnes is an Army civilian at Fort Lee, Virginia. He served in the Marine Corps and Army National Guard, retiring as CW4. He has a master’s degree in Anthropology and authored In a Strange Land; The American Occupation of Germany 1918-1923. World War I was the first worldwide war as belligerents pooled soldiers from their colonies and commonwealths. America was different and at the same time was the most internationally diverse army involved in the war. The massive immigration in the late eighteenth century up until the start of the war lead to the influx of Central, Eastern, and Southern Europeans. The Anglo-Irish immigration of the past was being overtaken by non-English speaking people. Immigrants formed communities people with like heritages and languages; many never learned to speak English. On May 18, 1917, Wilson signed the Selective Service Act into law the required all males to register for the draft. This included immigrants and African Americans (although they would not be integrated into the army and would serve in segregated units). America’s attempt to grow an army from its small defense force would be a challenge on many levels. First, the draft notices needed to be published in a variety of languages. Second, many showed up for training without understanding English. The army was also struggling to find enough leaders to train new recruits. Camps were set up in the south for training south and cantonments in the north — the difference being camps had tents and cantonments had barracks. Immigrants played a significant role in the war, and that created another problem for the United States. German immigration peaked between 1880-1889 making many of draft age. How would German immigrants react to being drafted to fight their former countrymen? Barnes reflects the Italian presence in the American army was quite large as well as pockets of others of European heritage. Asian immigrants were also drafted an served in the regular army although the registration papers only listed white and colored; yellow or Japanese was penned in by clerks. Carribean immigrants found themselves in segregated camps with African-Americans. Barnes adds personal stories and experiences of immigrants that served as well as some short biographies. The book is also illustrated with photographs of some of the soldiers giving the book a personal touch. It is truly remarkable that the army was able to field a capable fighting force. There were so many possible points of failure. Even something as simple as Albania caused confusion since it was a newly independent country in 1913. Birthplaces were listed as Albania, Italy; Albania, Greece; Albania, Turkey; or Albania, Albania. Twenty percent of those serving in the US army in WWI were foreign-born. There is no count on the first generation Americans raised in immigrant households. Immigrants played a decisive role in America’s entry on the world stage. The United States Army represented the most diverse force in the war. Forgotten Soldiers represents the sacrifice of those who fought for their adopted country. Excellent review. I never knew that about Albania, that there was so much confusion around it after its independence! This one sounds fascinating.